BABYBJÖRN Smart Potty perfectly combines functionality and comfort, and is ideal for smaller bathrooms. It’s comfy for your child to use, has a stylish minimalistic design, and its compact size means it takes up very little space. It’s also very easy to clean. It comes in a range of fun colours. Smart Potty is compact and convenient, and is ideal for smaller bathrooms. It takes up very little space and you can even pop it in your suitcase when your family goes on holiday. 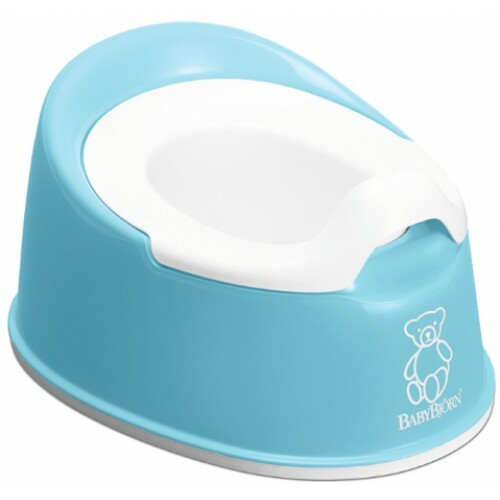 The rubber edging along the base ensures that the potty rests firmly on the floor, even if your child moves about. All bathroom products from BABYBJÖRN meet the relevant plastic safety requirements in both Europe and the USA. This means that the plastic we use undergoes continual rigorous testing for Bisphenol A (BPA) and other harmful substances, and is certified food safe. That’s important to us!